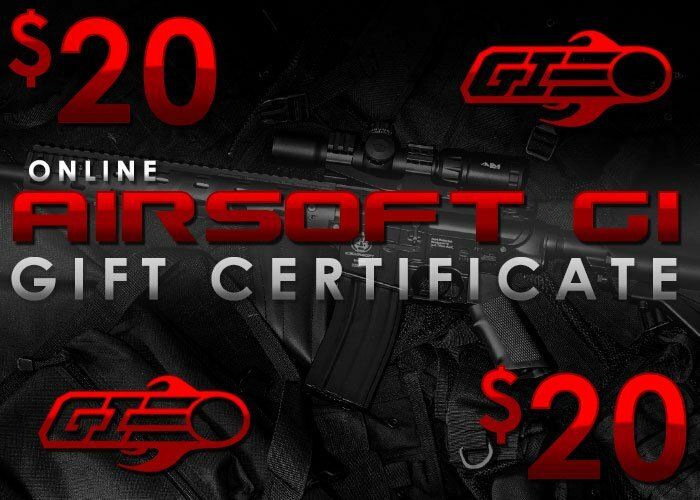 This $20 Gift Certificate can be purchased and later emailed as a gift certificate for someone that loves airsoft. Gift Certificate are purchased just like any other item in our store. You can pay for them using the stores standard payment method(s). Once purchased the value of the Gift Certificate will be added to your own personal Gift Certificate Account. If you have funds in your Gift Certificate Account, you will notice that the amount now shows in the Shopping Cart box, and also provides a link to a page where you can send the Gift Certificate to someone via email. Airsoft GI Gift Certificate can be used along with coupon codes. Airsoft GI Gift Certificate will take up to 24 business hours to process. To send an Airsoft GI Gift Certificate you need to go to our Send Gift Certificate Page. You can find the link in your Account Page. When you send a Gift Certificate, you need to specify the following: The name of the person you are sending the Gift Certificate to. The email address of the person you are sending the Gift Certificate to. The amount you want to send. (Note that you don't have to send the full amount that is in your Gift Certificate Account.) A short message which will appear in the email. Please ensure that you have entered all of the information correctly, although you will be given the opportunity to change this as much as you want before the email is actually sent. By clicking on the link contained within the email for this express purpose. This will take you to the store's Redeem Certificate page. You will the be requested to create an account or Login, before the Gift Certificate is validated and placed in your Gift Certificate Account ready for you to spend it on whatever you want. During the checkout process, on the same page that you select a payment method there will be a tick / check box to the right of the coupon field, click that check box and click the continue button to redeem your Gift Certificate balance on that purchase. If you have funds in your Gift Certificate Account, you can use those funds to purchase other items in our store. At the checkout stage, an extra box will appear. Ticking this box will apply your Gift Certificate Account to your purchase. Please note, you will still have to select another payment method if there is not enough in your Gift Certificate Account to cover the cost of your purchase. If you have more funds in your Gift Certificate Account than the total cost of your purchase the balance will be left in you Gift Certificate Account for future purchases. We are not responsible if you send your Gift Certificate code to the wrong email address, once you send it, it will be removed form your Gift Certificate balance. The Gift Certificate system is completely automated and we cannot undo any mistakes you make during the sending of Gift Certificates to the wrong person. Gift Certificates cannot be converted back in to cash once its been approved and added to your voucher balance. For any queries regarding the Gift Certificate System, please contact the store by email at: [email protected] Please make sure to give as much information as possible in the email. Should be 20 fps (JK this is a $20 gift card).